Eastern European singles portal Elena's Models joined calls to ban chat bots on dating sites. The practice of using automated messages to lure customers has been in focus of investigations into dating scams and fraud in recent months. Elena's Models joined calls to ban the use of chat bots on dating sites. Elena's Models never used chat bots or any automated software to initiate communication on the site. We refuse to do it and will never do it. Eastern European singles portal Elena's Models joined calls to ban chat bots on dating sites, unless the site specifically announces that robotic messages are sent to users. The use of chat bots on dating sites came into focus recently, after Rolling Stone published an article on widespread use of fabricated profiles and computerized programs to lure customers, discussing "Scammers and Spammers". Elena Petrova, founder of Elenasmodels.com, agrees with industry insiders that the practice is pervasive. Petrova points out that within the Eastern European sector aimed at the international dating market chat bots are widely used to engage and draw in potential clients. "Elena's Models never used chat bots or any automated software to initiate communication on the site. We refuse to do it and will never do it," Petrova stated. She explains that the use of automated bots to start a pretend communication from the profiles of real users could cause justifiable anger of their owners. Petrova believes that a site would need to employ fake profiles in order to utilize a chat bot without upsetting bona fide users. "With the majority of international dating sites offering contacts with Russian singles, simply logging into the site causes an instant torrent of chat requests from beautiful women popping on the screen, even if it's 4 am in Moscow and 3 am in Kiev. A new male user immediately gets dozens of chat invites from stunning women who are apparently not sleeping at nights to offer their affection to men, who haven't even had time to create a profile or upload a photo. "I have been operating a dating site for Russian, Ukrainian women for 17 years and I never seen anything like this happening on EM. What I do see is that women prefer men to initiate contact. Male profiles without photos get very little attention, usually from older women who are desperate to meet someone. "This hasn't changed for the last 17 years. Beautiful women usually get enough attention and don't need to pursue men," Petrova stated. "Chat bots used in combination with fake profiles create an unfair competition, especially if the use of automated software to initiate communication isn't clearly spelled out in the terms of service," Petrova said. "It's abnormal for women to pursue men, so it's a scam pattern. After manual checks, we usually find that the woman is either unattractive and therefore anxious, or it is an attempt by a competitor to lure customers to another service, or some other dubious activity." Elena's Models founder believes that the industry is in desperate need of regulations that oblige operators of dating sites to disclose facts of employing robots or paying commissions to agents for communication with users who provide their credit cards details. "A great number of Russian dating sites targeting international customers pay commissions for each communication to their agents (partners), the fact that they do not disclose to paying clients. "I read ads on Ukrainian job portals offering payments to women for chatting to men on dating sites. It is possible because these dating sites pay commissions for chats and letters. These ads present fake communication on dating sites as a normal job, even talk about potential "career growth", whatever they mean by that. "The customers of these sites are not only attacked by chat requests initially, but also may be defrauded during the follow up communication, because the site charges male users for each message (pay-per-letter, or PPL). While these sites make out as if they were trying to eliminate such scams, it doesn't seem to be working. The number of ads on Ukrainian job portals seeking employees to chat with men on dating sites increased by 50% in the last 6 months. 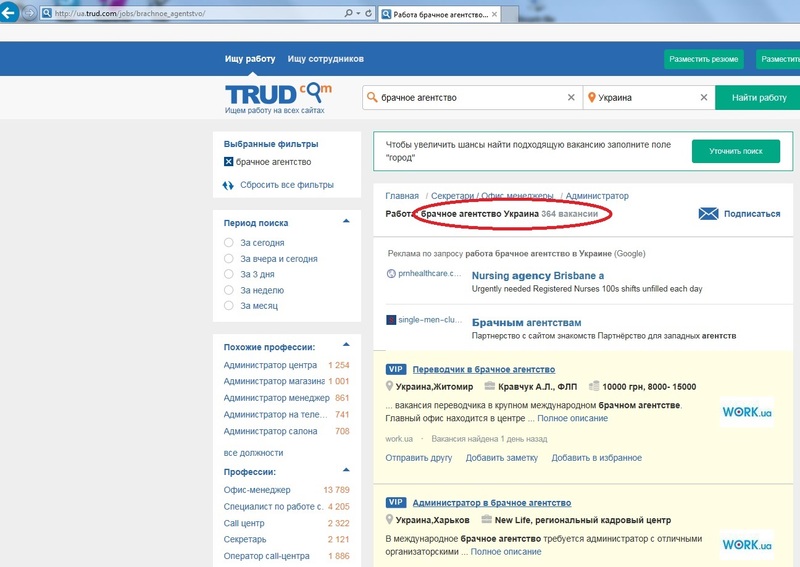 Ads promise 20-50% commissions to employees from their profile's earnings," Petrova explained. The issue of fake communication has been plaguing pay-per-letter (PPL) sites for years. 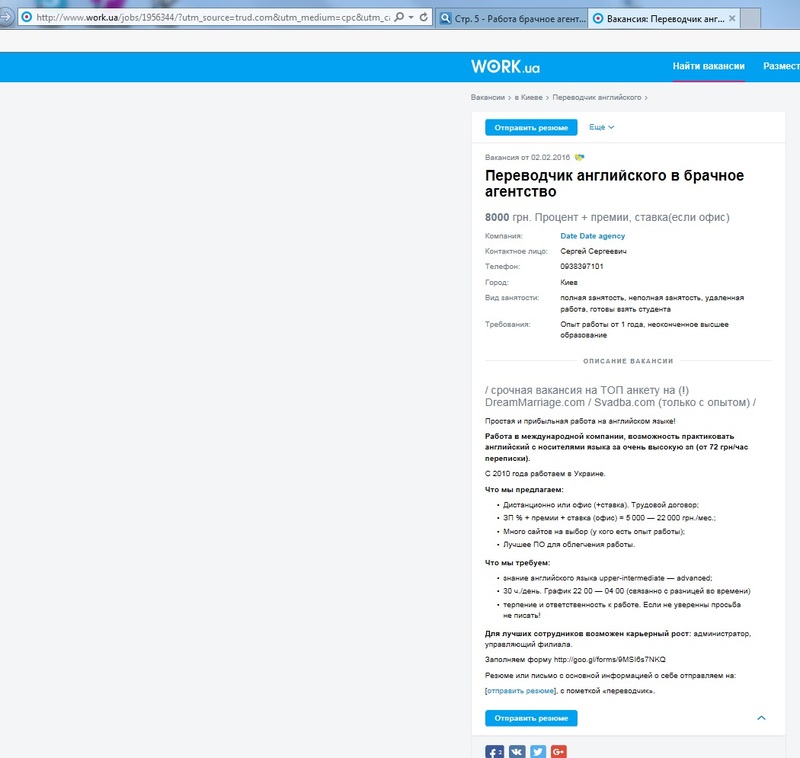 Reports about scams were published in Russian media but the problem persists, Petrova affirms. "Since this is a well known problem on paid chat dating sites, which they admit themselves, it would be fair if such sites were obliged to disclose the fact that they pay commissions for each communication," Petrova said. "If there is a legislation on chat bots and other disclosures, it should be noted that a regular consumer doesn't read long contracts when registering on a dating site. Thinking about Joe Average, the warnings should be upfront in prominent positions and bold font size 18-24, placed on pages where people pay. Only then we may hope that users will notice them," Petrova acknowledged. Elenasmodels.com is an international dating site for people seeking relationships, romance, and long-term partners. It has been established in 1999 and listed over 2 million user profiles since that date. Elena's Models users live in more than 170 countries of the world. Elena Petrova, founder of Elenasmodels.com. 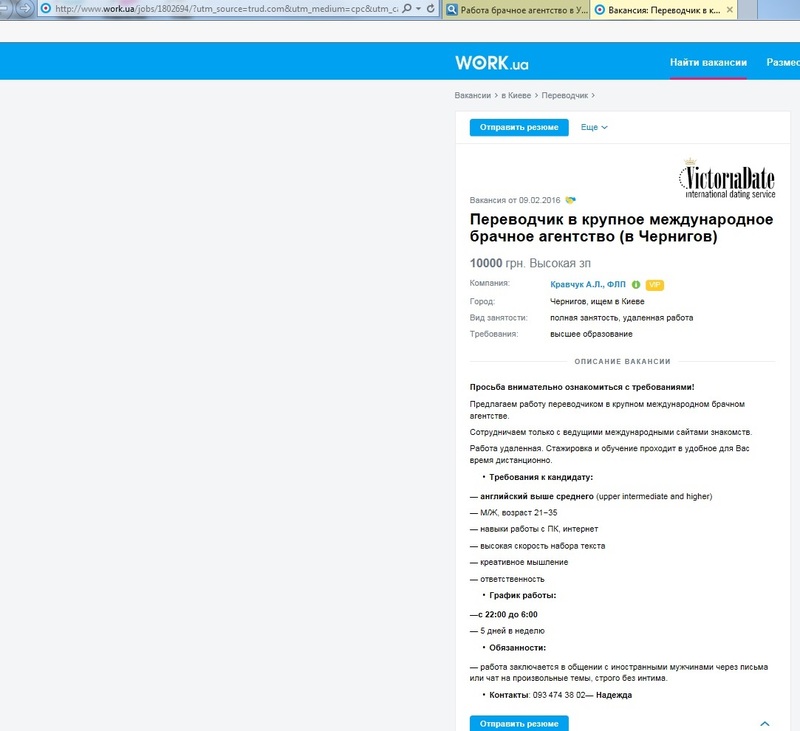 Screenshot shows 364 vacancies in Ukrainian marriage agencies.The number of jobs offered by agents of dating sites in Ukraine increased by 50% in 6 months. Vacancy in a marriage agency for women to chat on dating sites.Hundreds of job ads require employees to chat with foreigners at nights, offerring commission-based wages. Men and women are invited to chat on dating sites, posing as pretty women from profiles.The ads stress the need for employees to speak English and work at nights, due to time difference with the USA. 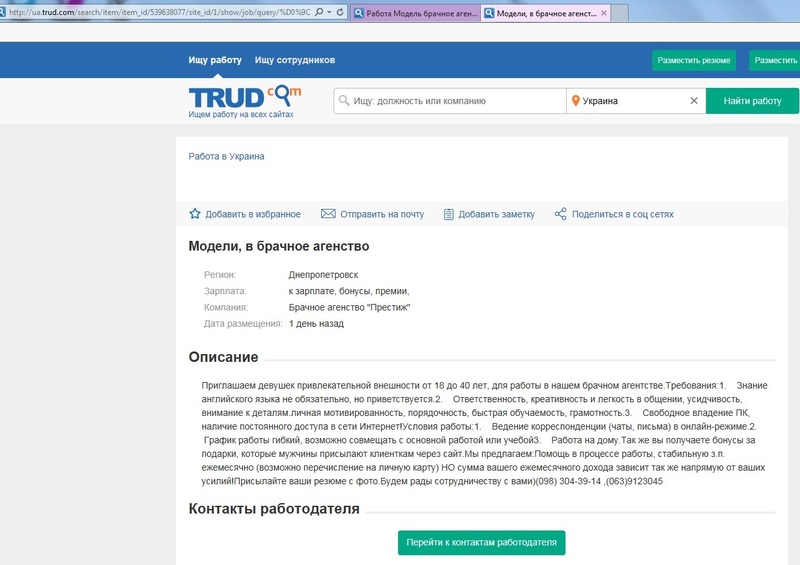 Screenshot shows vacancy marked as urgent, requiring an operator for a "Top profile".If a substitute typing letters on behalf of a certain profile leaves, the agency needs to find a replacement. 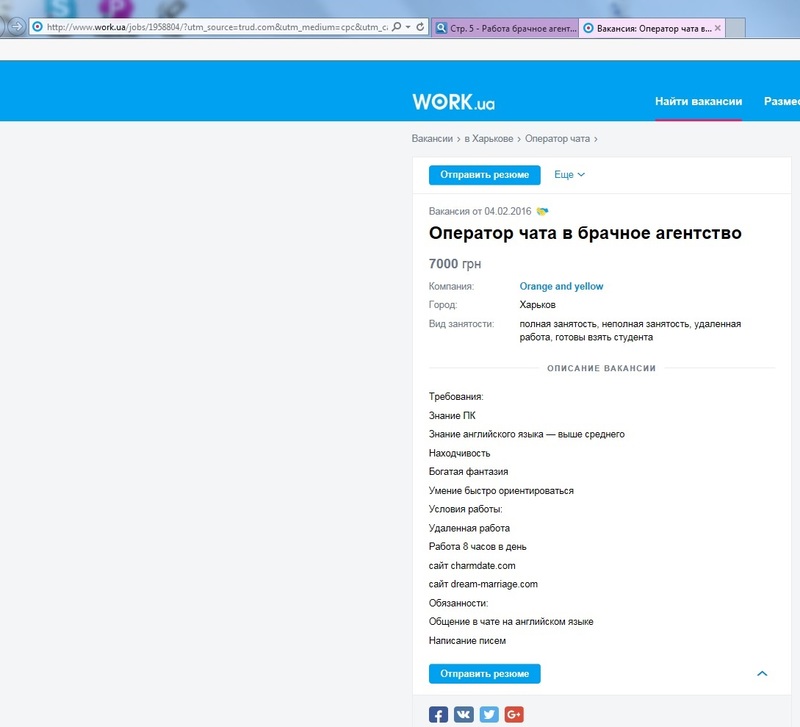 Job vacancy for women over 18 to chat with men on international dating sites.Every night hundreds of Ukrainian chat operators try to engage American men in chats to earn commissions. 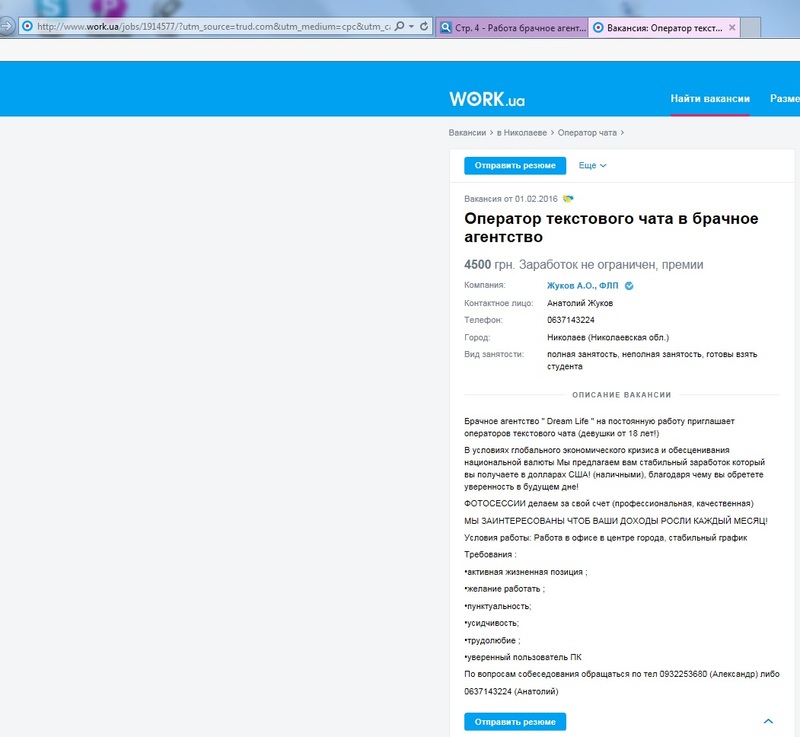 Agents in Ukraine hire personnel to chat with men online.The spread of jobs in paid chat is possible because men are charged for communication. The men who pay for chats do not realize that women are being paid for talking to them. The majority of agents supply profiles to several paid chat dating sites.This ad offers 40% of income from communication to the employee.